Emerging Markets stock fund has been one of the outperformer asset classes of mutual funds for the past 3 years. One of this popular EM equity funds is Lazard Emerging Markets Equity Open (LZOEX) fund. This Lazard fund invests in undervalued emerging market companies. More details about the fund review is described as follow. 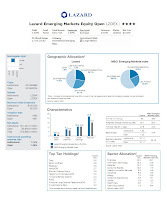 The investment objective of Lazard Emerging Markets Equity Open fund is to seek long-term capital appreciation. This equity fund invests mainly in undervalued equity securities of non-U.S. companies located in emerging market countries. James Donald has been the lead manager of this Lazard fund since November 2001. He is the Managing Director of the Investment Manager. The fund was first introduced to public in January 1997. This fund has dividend yield of 1.02%. The most recent dividend distribution was in August 2011 ($0.01). 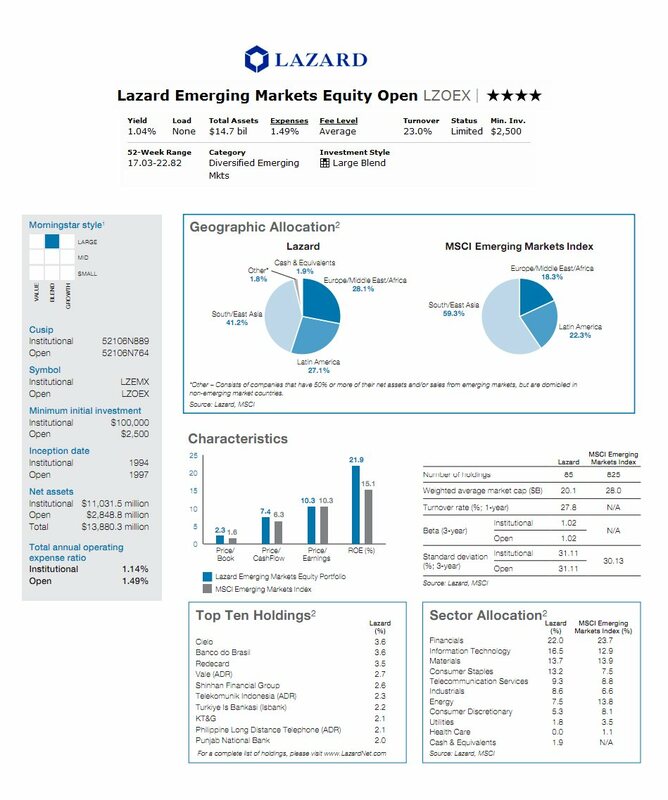 The average annual expense ratio in Diversified Emerging Markets category is 1.67%, while this LZOEX fund has annual expense ratio of 1.49%. As of November 2011, the fund has total net assets of $15.23 billion. Morningstar gave this fund 4-star rating. It has 6.66% YTD return. Based on the load adjusted return, this international stock fund has returned 18.19% over the past 10 years and 21.26% over the past 3-years. This fund has recorded in 8 years of positive return and 5 years of negative return. The best 1-year total return was achieved in 2009 with 69.14%. The fund’s benchmark is MSCI Emerging Markets Index. Besides this Open Class, this Lazard Emerging Markets Equity Fund is available in Institutional Class (LZEMX) as well. The minimum initial investment for LZOEX is $2,500 and $100,000 for LZEMX. The Institutional Shares was incepted earlier in 1994 with the annual expense ratio of 1.14%. There is a 0.25% of 12b1 fee, but no front-end sales load fee. There is a wide selection of 104 brokerages for purchasing this fund, such as Merrill Lynch, JP Morgan, T Rowe Price, Schwab Retail, Fidelity Retail Funds Network, Royal Alliance, Raymond James, Td Ameritrade, E Trade Financial, etc. As of the third quarter of 2011, the top geographic allocation of this top emerging market stock fund is South-East Asia (41.2%), Europe-Middle East-Africa (28.1%) and Latin America (27.1%). The top 10 holdings out of 85 total holdings are Cielo (3.6%), Banco do Brasil (3.6%), Redecard (3.5%), Vale-ADR (2.7%), Shinhan Financial Group (2.6%), Telekomunikasi Indonesia – ADR (2.3%), Turkiye Is Bankasi (Isbank) (2.2%), KT&G (2.1%), Philippine Long Distance Telephone – ADR (2.1%) and Punjab National Bank (2.0%). Per the fund’s prospectus, the principal investment risks of this fund include market risk, management risk, emerging market risk, political risk, foreign currency risk.